It’s no secret that Rovio purchased the rights to Casey’s Contraptions and has been planning a new release. Back in May it was discovered that Rovio registered the domain AmazingAlex.com and it was thought that Amazing Alex would be Rovio’s next big release. It looks as though those predictions were correct because Rovio has launched AmazingAlex.com and announced on its blog that Amazing Alex will be its next mobile game. Amazing Alex will be a puzzle game where Alex uses objects to create complex chain reactions. While the promo video doesn’t give us too much information on the actual gameplay, according to the official website, the game will feature 100 levels, 35 interactive objects, and the ability to build and share your own levels. 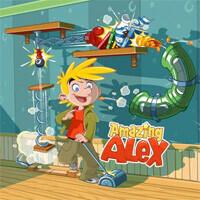 Amazing Alex is set to debut sometime this month and will be available for iPhone, iPad, and Android devices. I'll probably waste a night playing through it. Something about mobile gaming gets me hooked, especially when there are puzzles involved. if Rovio has anything to do with it it's going to rack money big time. that's the only real downside to WP is the lack of seeing that "launching on Windows Phone!" more places. Most likely because this game has been under development well before Windows started to pick itself up. After it launches, it'll most likely be ported to WP's just like Angry Birds. On another note, I'm glad Rovio moved on from the birds. They were played out.